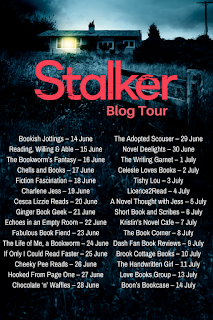 Welcome to my stop on the blog tour for Stalker by Lisa Stone! 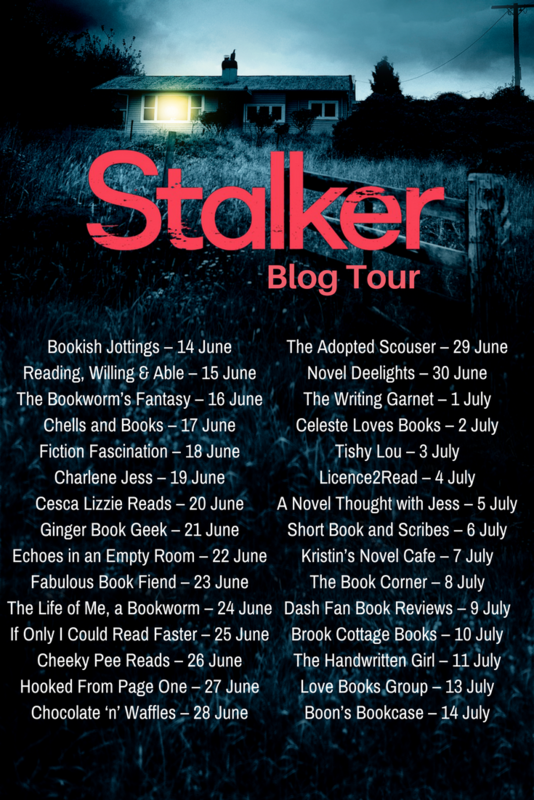 I have an exclusive extract for you today and I tell you something, this sounds fab!!! Because Mr and Mrs Osman couldn’t leave the shop unattended, they came through to the stockroom separately to learn how to access their CCTV online, so it was three o’clock before Derek arrived home. His mother was exactly where he expected to find her – in the living room, watching television. She wasn’t surprised to hear him come in early, for his wasn’t a nine-to-five job. ‘I know, I will,’ he said, bristling. She treated him like a little boy. In the kitchen Derek put his lunchbox in the sink for washing later, poured himself a glass of water and went upstairs to his room where he would stay until she called him for dinner. It niggled him that she went into his room at all. At his age – forty-one – it should have been his domain, and she could have left his laundry in the airing cupboard, but he didn’t complain. 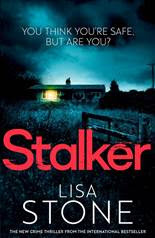 He always turned the monitors off when he was out and even if she switched them on, which he doubted she would, she wouldn’t get any further than the screen savers, as the system was heavily password protected. It was the fact she had entered his territory at all that he bitterly resented, but he felt powerless to say anything. With his bedroom door bolted, Derek sat in his office chair at his workstation, took a sip of water and powered up the monitors. As soon as they sprang into life he began searching local newspapers for updates on the stabbing at U-Beat nightclub. What Paul had said was worrying him. The police were appealing for witnesses, the articles said, and anyone with any information should contact the number shown below. They were especially interested in talking to a motorbike rider seen leaving the area shortly after the incident, but there were no more details. Derek opened the folder where he’d downloaded the footage from the CCTV camera at the front of the nightclub. When he’d watched in real time – as the attack had happened – he’d been concentrating on the actual action; now he scanned it for anything he might have missed. On the very edge of the screen he spotted a figure in black running from the alleyway just after the attack, but there was no motorbike in view. He rewound to an hour before the incident and trawled through the footage, again concentrating on what was going on at the edges of the camera. His patience was eventually rewarded and he now saw what the police had presumably seen – what looked like the same figure entering the alley thirty minutes before the attack, but not detailed enough to make an identification, and no sign of a motorbike. He watched the footage for a few minutes more, then satisfied he had the same information as the police, closed the file. I'm so looking forward to reading this! It sounds utterly thrilling! !